RRResearch: Doing an experiment at last! Only a tiny experiment, but it's a start. I need to test some E. coli strains to find out whether or not they have recA mutations. 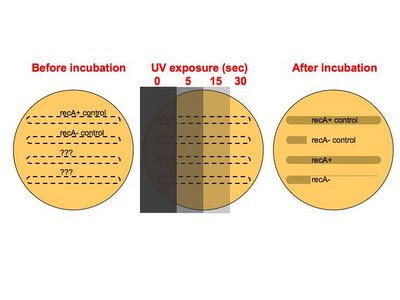 Because RecA regulates DNA repair, the easy phenotypic test is UV sensitivity. Here's a diagram of how it's done. First find a piece of cardboard and a short-wavelength UV lamp (I use the handheld one we sometimes use to look at DNA in gels). Lightly streak each strain you want to test onto an agar plate, as shows in the Before picture, being sure to include both recA+ and recA- controls. Then expose different parts of the streaks to the UV, using the piece of cardboard to shield the rest as shown in the middle picture. (Be sure to take the lid off the petri dish because the plastic is UV-opaque.) Then incubate the plate overnight. If your UV dose is appropriate, you'll see the growth shown in the After picture. This is very quick and easy, but it's not foolproof. If the UV dose is too high none of the strains will grow in any of the exposed areas, and if it's too low all the strains will grow everywhere. If you make the mistake of streaking the cells too thickly the cells on top will shield the cells underneath them and all the strains will grow everywhere. Because this is the first time I've done this with E. coli since I was in grad school, I'll need to try several different combinations of lamp distances and exposure times.